Welcome to the Spring 2015 newsletter from Rhys Vineyards! In addition to tasting notes on the wines being offered today, this seemed like a good time to update the “Tasting Notes” section of our website and discuss the current characteristics and drinking recommendations for past vintages. We are also making some changes to our release schedule and would like to provide customers with a release calendar to help plan purchasing for the remainder of the year. 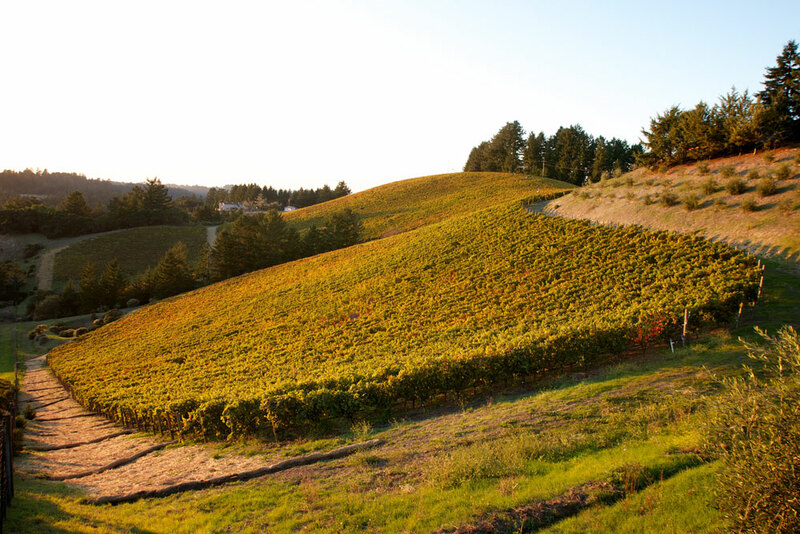 Horseshoe Vineyard, with the steep hillside Pinot in the foreground, Syrah on the left and Chardonnay on the right. The 2012 Bearwallow is a great example of the vibrant red, cherry skin fruit and terrific spicy character that this site is capable of producing. From the wet sandstone nose to the fantastic mineral focus on the finish, this Pinot shows even more pronounced vineyard characteristics after 5 years of careful farming. The 2012 Horseshoe Pinot has evolved beautifully over the last year in the bottle. Today it shows a knockout kaleidoscopic and earthy nose followed by intense perfectly ripe red fruit. The focus, tension and energy of Pinot Noir from this site is compelling. Don’t miss this one. This vintage of Horseshoe Chardonnay is an intense and racy laser beam. The intoxicating nose offers wet rocks, hazelnuts, jasmine and honeysuckle notes while the palate shows great verve and intensity. This young, tightly wound Chardonnay can be enjoyed now but will be even better with age. The 2012 may be the greatest Skyline to date. It offers great intensity with loads of the exotic spicy complexity that makes this site so amazing. After recently opening a bottle of each Skyline vintage, we are convinced that this is one of the New World’s greatest terroirs. It takes a few years in the cellar for the intoxicating perfume to fully emerge so please be patient! The 2012 vintage produced a Swan Terrace of intensity and effortless balance. The nose offers the typically gorgeous high-toned floral and mineral notes. On the palate this Swan Terrace combines red-fruited elegance and intensity with great energy and a long savory finish. Very special. This beautiful Syrah was picked November 2 after a long cool ripening period. This extended harvest produced a Syrah of exceptional complexity and energy. Unlike most vintages of Horseshoe Syrah, in 2011 we elected to remove the stems before fermentation. The resulting pure, red-fruited Syrah shows great saline, savory and mineral notes which are extremely unique and just plain delicious. 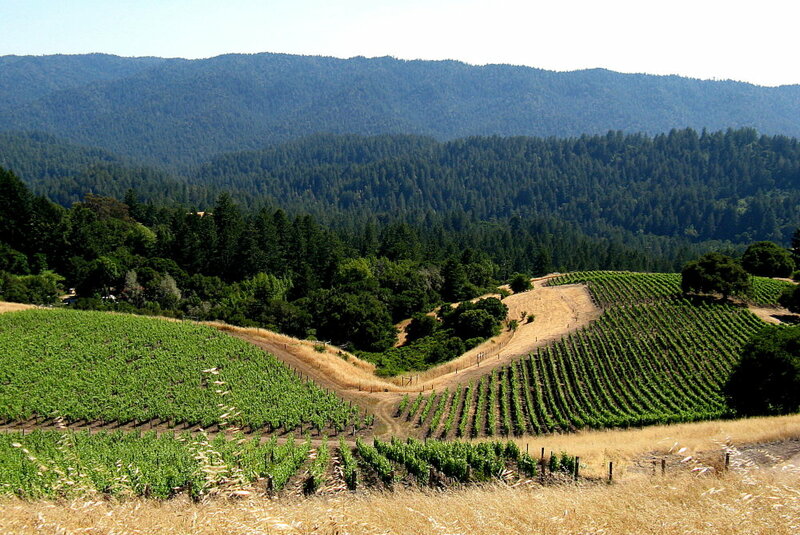 A perfect summer day at our Skyline Vineyard, where all farming is done by hand. Some customers have mentioned that our release calendar can be quite compressed (and put a lot of pressure on credit cards!) In general this compression is driven by the very short window of weather that allows us to safely ship wine to all parts of the country. In order to spread purchases out and still allow time for packing and shipping under ideal temperatures, we have constructed the following release calendar for 2015. January 27 – The second and last tranche of 2012 Pinot and Chardonnay. 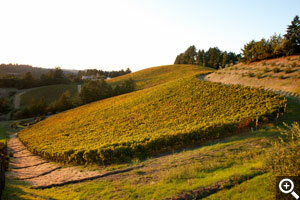 March 31 – 2013 Horseshoe Vineyard Futures offering including Pinot, Chardonnay and, for the first time, Syrah! May 19 – Pre-summer offering of 2012 Alesia Pinot and Chardonnay. 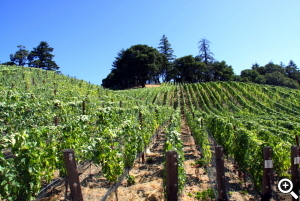 July 21 – Summer Offering of 2013 Rhys Pinot and Chardonnay (formerly called the Fall Offering). As before, these wines will ship in November. October date TBD – 2014 Futures Offering. 2014 will have smaller quantities available for Futures compared to the 2012 and 2013 vintages. Please note that participation in any of these offerings is completely optional though we do request that customers purchase at least once a year in order to maintain guaranteed allocations for the vintage offerings. Our Futures offerings have been a huge success! In addition to allowing customers to secure non-standard bottles and case quantities, these offerings help us manage the great fluctuations in production that our mountain sites can experience. This means that customers may not see the same bottlings or quantities offered for Futures each year. For example the 2014 Futures offering will be more limited compared to the 2012 or 2013 vintages. 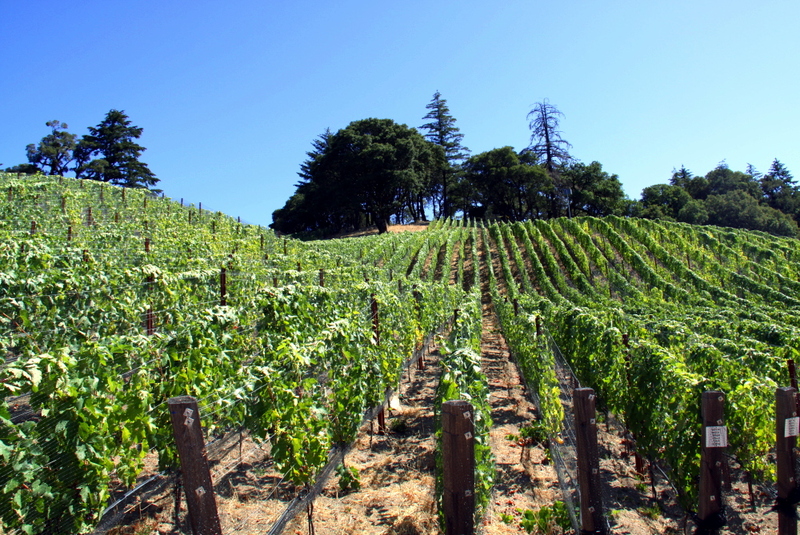 Instead of the typical 12 month vintage release cycle, 2013 Rhys wines will be offered over an 18 month period that will span Fall 2015 through Fall 2016. This will help return to a schedule that allows all wines at least one year in bottle before being offered. Looking forward, we are extremely excited by the very high quality vintages in the cave. By now many customers have tasted the exceptional quality of the 2012 vintage and the next two vintages, 2013 and 2014, have delivered comparable or even higher quality. From a production standpoint, the 2013 vintage was quite plentiful while the 2014 production level was more moderate and typical of our low yielding vineyards. Looking across the heart of Alpine. D Block in the foreground, Hillside in the evening light behind, and Swan Terrace in the distance on the left. Each year at this time we open our library and taste through past vintages of each Rhys wine that we have made. The primary goal is to provide customers with updated tasting notes and drinking window recommendations but it is also quite educational to revisit our winemaking decisions and see how the wines are showing. Notes on specific wines are published on our website HERE, but we thought customers might also enjoy reading the more generalized vintage summaries below. 2012 was an easy vintage with moderate temperatures and great hang time at harvest. The wines combine good ripeness with the highest acidity we have seen. After a year in the bottle, our impression of each wine is even more positive than our heady initial impressions. It will be great fun to check back after a decade or so and pick a favorite vintage from the strong 2012, 2013 and 2014 trio. The ‘12s can all be approached today but deserve some cellar time to open and improve. Unlike our earlier vintages these wines will not need as much air upon opening. This very atypical vintage has been quite unpredictable from the outset. Given the cool conditions and high acidity, we expected these wines might be stubborn in the cellar. Instead they are aging at a good pace and many are quite approachable. In particular wines like the Bearwallow, Family Farm, Home and Skyline are drinking very well already. The Horseshoe Pinot is quite special but like the Alpine Pinot, it will be much better in a few years. 2010 was a cool and variable year with vicious heat spikes. These conditions make it harder than usual to generalize about the wines since the timing of the heat affected each vineyard differently. Overall we are quite happy with the vintage at Rhys. Right now the Family Farm, Skyline, Home and Bearwallow are drinking well while the Alpine, Horseshoe and Swan need more time. 2009 produced some of the ripest wines we have seen. While we initially worried about this, the wines are drinking quite well and in many cases have lost their initial baby fat. In particular the Alpine, Swan Terrace, Bearwallow and Skyline are showing very well. Like 2010 some of the wines still need a couple of years in the cellar. 2008 wines are best described as hugely concentrated and hugely structured. This structure is taking its time to resolve and all of the wines will be much better in a few years. These wines require air to be enjoyed now. If opened, we recommend a good hour or more in a decanter before drinking. The most approachable wines from this vintage are Family Farm, Bearwallow and Skyline. The 2007 vintage has been a bit frustrating. After showing very well in barrel, the wines shut down completely once bottled and have remained impenetrable until recently. The Family Farm and Skyline are opening and the Skyline is a real knockout. The Horseshoe Pinot is also stirring from its slumber. We still recommend more cellar time for the Alpine, Alpine Hillside, Swan Terrace and Home Pinots. In hindsight, 2006 was probably one of the weakest vintages for CA Pinot in the last 10 years. 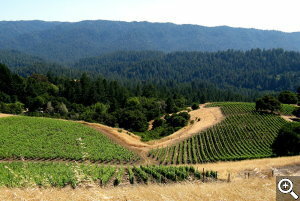 It was also the first vintage of full production for Alpine and Family Farm vineyards. Given this vintage context, we are extremely happy with the evolution of our 2006 Rhys Pinots. The wines are still youthful but have entered their long drinking window. Right now the Alpine and Swan Terrace are drinking well. The 2006 Alpine Hillside still requires some decant time but has shown quite well in blind tastings of similarly aged Grand Cru Burgundy. We expect the 2006s to be going strong at age 20. No Rhys wines were produced in 2005. 2004 was Rhys’ first commercial vintage and we made just a few barrels of estate wine. The wines are fully mature now and drinking well. It is fun to taste these garage wines, including the first Alpine Pinot and Chardonnay, and see the early promise of three of our sites. Thank you again from all of us at Rhys! Follow our harvest and happenings at http://twitter.com/RhysVineyards. Please send any comments or request to info@rhysvineyards.com or visit our website at www.rhysvineyards.com for more information.